Creative Electric LLC, founded in 2010, provides full-service commercial, residential, and industrial electrical services. Our team of dedicated professionals specializes in a wide variety of projects. Jobs large and small, we are committed to serving Connecticut’s residents’ electric needs. We are proud of the work we do, offering personal care with each job while always offering a fair price. Be in touch to learn more. We look forward to completing your next electrical project. It was a pleasure working with you and your team. From the beginning, it was apparent in the pride you have in your business. It reflects in your quality workmanship, incredible work ethic and fair pricing. You and your employees were always on time, polite and respectful. I appreciated that you listened to our ideas and needs and incorporated your knowledge of which products were best to use in our home. The result is amazing and we could not be more thrilled with how the job turned out. Thank you for helping to make our house into a home!! They came on time and even worked on a Sunday to finish the job so I could move in the next day. They were extremely polite, worked swiftly, carefully, cleaned up after themselves, and were most accommodating. I could not have asked for a more efficient group! We renovated our antique Georgian Colonial over the summer of 2012 and were fortunate to have Creative Electric on the job. Joe's professionalism, knowledge and excellent communication made working with him for more than 6 months an absolute pleasure. He is prompt and dependable, and we will call him for any future electric work we may have. 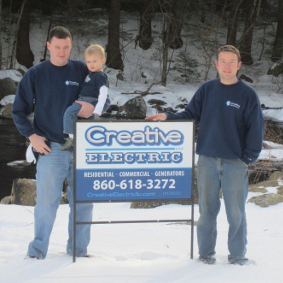 We highly recommend Joe and his team at Creative Electric.